They're all shook up in the Scottish village of Lonmay. A Scottish writer's assertion that Elvis Presley's ancestors came from this quiet corner of northeast Scotland has fixated fans and brought batches of curious journalists and TV crews to the village near Aberdeen. Mindful that Elvis's Graceland mansion in Memphis, Tennessee, gets more than 1 million visitors a year, the Aberdeen and Grampian Highlands Tourist Board has seized on the prospect of an Elvis connection with delight. "It could be really good for tourism," Ian Hainey, spokesman for the Aberdeen and Grampian Highlands Tourist Board, said Thursday. "We get Elvis fans coming to Prestwick, even though Elvis only spent an hour there once," he said, referring to Presley's brief stopover at the Scottish airport in 1960. In his book, "The Presley Prophecy" — yet to be published — Allan Morrison says he has traced The King's ancestry back more than 250 years, using local records and the files of the Church of the Latter Day Saints in the United States. Morrison, who has published several humorous books about Scotland, says that on Aug. 27, 1713, eight generations before Elvis's birth in 1935, his ancestor Andrew Presley married Elspeth Leg in Lonmay. Their son, also called Andrew, became a blacksmith and was the first Presley to leave Scotland, emigrating to America in 1745. "Scottish genealogy is a high profile, popular subject, and it gets no bigger than Elvis Presley," Morrison said. He said Andrew Presley had lived through the Jacobite rebellion, when mainly Roman Catholic supporters of the exiled Stuart kings of Scotland rose up against the Protestant kings of England, who ruled both countries. Todd Morgan, a spokesman for Elvis Presley Enterprises in Memphis, said he looked forward to reading Morrison's book and had no reason to doubt his findings. But Morgan also said, "Our own exhaustive genealogical research on Elvis is not complete... We hear from genealogical researchers all the time, and various elements of Elvis' family have been traced to various cities and areas around the world." There are no signs yet of attempts to cash in on the Elvis phenomenon, although Hainey from the tourist board said, "If there is a market, I am sure it will be fulfilled." A newspaper reported Thursday that the Ben-Car Hotel in Lonmay had fallen foul of the Elvis Presley Enterprises, controller of the Presley copyrights, for applying to rename itself Heartbreak Hotel. But owner Christina Gibbins said this was the result of a joke gone wrong. "We host a lot of weddings, so calling ourselves Heartbreak Hotel would not make a lot of sense," she said. "We're treating this as a bit of fun." Morgan also denied that such a dispute had arisen. Paul Downie, spokesman for Scotland's Elvis Touch Fan Club, said fans have suspected for years that their idol was connected to Scotland. "I think fans will want to visit Scotland and Lonmay — I imagine there will be an upsurge" in visitors, he said. Jim Presly, 70, who has lived all his life in Oldmeldrum near Lonmay, has done his own research and agrees with Morrisons' hypothesis. "Oh yes, 100 percent," he said. "I've checked the local records and I now believe Andrew Presley emigrated from the Lonmay area. He has an old family bible showing the Preslys used to spell their name Presley, he says; "Over the years it got changed." Presly said he had always been questioned about the singer because of his name. 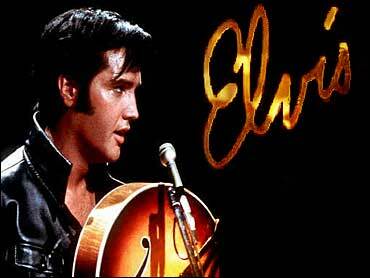 "Tell them I'm open to offers from Graceland," he quipped.